Report finds 908 environmentalists killed over last decade, half of them in Brazil. 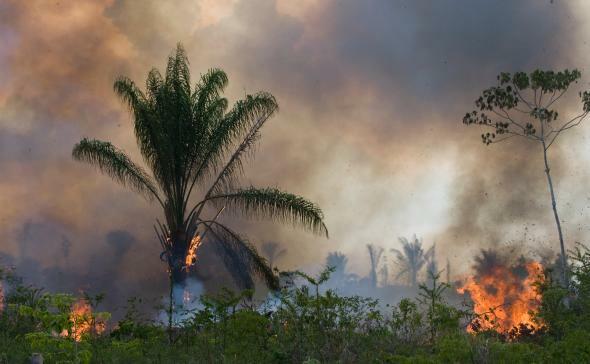 A fire burns part of the 500 thousand hectares of the Tapajos National forest in Northern Brazil on Dec. 1, 2009. According to a report released today by the London-based NGO Global Witness, at least 908 environmental activists have been killed over the last decade. That number is comparable to the 913 journalists killed in the course of their work in the same period and is likely on the low side—reporting is inconsistent in many countries, and full data for 2013 hasn’t yet been collected. 2012 was deadliest year ever for environmentalists, with 147 killed. According to the report, more than two-thirds of these killings took “took place in the context of conflicts over the ownership, control and use of land,” reflecting the dark side of rapid development in many emerging economies. The most dangerous country in the world for environmentalists is Brazil, with 448 killings over the last 10 years. According to the report, “this can be attributed to Brazil’s land ownership patterns, which are among the most concentrated and unequal in the world.” The country’s rapid economic growth has frequently brought powerful business interests into conflict with small and medium-sized farms as well as indigenous groups, often with deadly consequences. To be fair, the high totals from Brazil may also be a result of the fact that the country has a relatively robust civil society and media sector, so killings in the context of land and environmental disputes are more likely to be reported. Some of the best-known cases involving the killing of environmentalists have been in the country, including José Cláudio Ribeiro da Silva and his wife, Maria do Espírito Santo—two Amazon activists shot by gunmen in 2011. There was also the murder of American-born nun Dorothy Stang in 2005, and rubber tapper Chico Mendes—since proclaimed Patron of the Brazilian Environment by the government—in 1988. These cases were unusual in that they prompted national and worldwide outrage and that in all three, perpetrators were eventually convicted. Globally, the report found that only 10 killers of environmental activist have been convicted over the last decade.